I love this blanket! It's color is true and it is sooooo soft! I have the peach color. 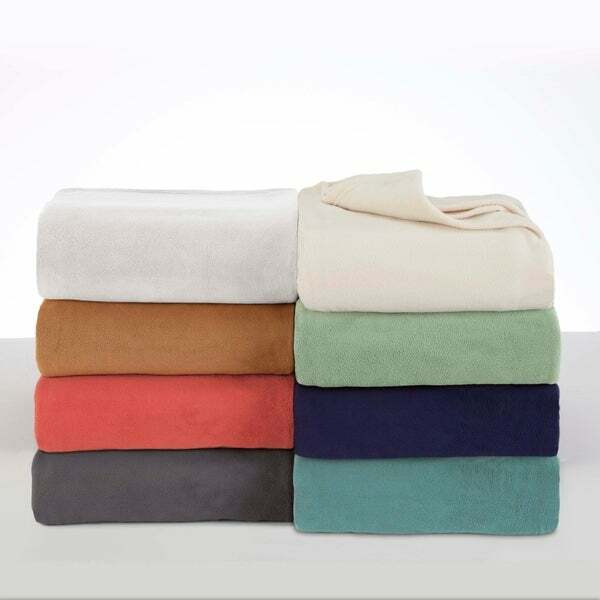 Keep yourself warm during those cool nights with this Vellux Fleece Blanket. Wonderfully constructed, these blankets are incredibly durable and are made of 100-percent polyester and will keep you cozy all year long. The blanket is offered in twin, full/queen, and king sizes and are extremely easy to care for. Love this blanket, it is very soft and lightweight. Don't be fooled by how lightweight it is, I use it as my only blanket most of the year. The color is true to the picture. I expected a Vellux blanket. This is some kind of thin slimy mess that sticks to your body, shocks you with static electricity, and what's with the gigantic size. I ordered full/queen and this darned thing must be California King. I put it on the guest bed. Going back to *** or *** for a real Vellux blanket. this blanket is so very soft, the color was just right and the weight was good for the cool fall nights in florida. Fleece tends to "pill", after washing.....this is perfect. I did buy a double/queen size.....would probably go with King on this blanket....Great product! This blanket is not what I expected. I thought I ordered a fleece blanket. What I got was a microfleece blanket. It's not the same thing. This is a cheap lightweight blanket. How do I get a real fleece blanket? I have purchased Vellux fleece before and it was nothing like this. This Vellux Fleece Blanket is wonderfully soft and warm and the "desert fig" color is a rich burgundy. I bought this for the guest room and my guests say they love the feel of it. Not amazing, but pretty nice for a fleece blanket. We use them as throws in our living room, and they are durable and stay pretty clean even with cats hanging around! I really liked this blanket because it was the perfect size, color and thickness to drape over the back of my sofa. This blanket gave my sofa a pop of color and it is conveniently located to keep me warm when needed. This is not really vellux as I expected from the description. Instead, it is thin fleece with a little polyester stretch. Based on other blankets I’ve ordered from O, I expected this to be as described, but it’s definitely not. The colors are much more subdued than the pictures show. It is a more expensive version of something you might find in a low end store. If your looking for quality, skip this. Have not use the product yet, but it appears to be nice. It doesn't shed like the older blankets on the floor and bed because the backing is different. Nice quality, good value for money. What I love the most about this blanket is the comfy softness! It’s a great blanket to wrap up in on the sofa and watch a good movie . Its also been good to use in the guess bedroom for a great splash of color. I ordered this to cover our reclining loveseat. It also matches our new chair ottoman we bought at Overstock.com. with a dog and cat, we needed a couch cover without being pricey, this fits the bill perfectly! I would recommend as is sturdy and this blanket comes in numerous colors! Thanks again Overstock!! I got this for my son as a Christmas present. He loves it - says it looks and feels so rich! Exactly as described. Quick delivery! Wonderful, warm blanket. Just what we needed for keeping us warm on cold nights. I have used it as a throw when watching TV also. It is soft and cuddly. Lightweight and warm. It is in our guest room and the first guest to use it asked where I got and then went onto Overstock and bought one for her home. So soft. Bought the rose/salmon colored one. A beautiful shade that matched my comforter set perfectly. Would buy again. previous order of same, good mdse. New platform bed and this would be a good cover versus comforter. This is what my son was looking for. Replace a similar blanket that was at least 10 years old. Wanted king size hunter green and could not find it in stores. What I was looking for in the color I wanted. Because I have enjoyed the Vellux blankets in the past. In fact, completely wore them out w/use and washing. They are a good year-round blanket. I have had them before and needed new ones. The old blankets have worn out. Need a warm blanket and I lock polor fleece. Previously owned a Vellux blanket, creates a nice warmth. "What is the warmth rating of this blanket? I have heard of ratings like 100 and 200, where does this one stand?" Hello Mskldy, this blanket has ratings for warm, warmer and warmest. This is rated between warmer and warmest. Have a great day! "Will this blanket shed or pill?" Hello jennifer, you should not have any issues with shedding or pilling. Thanks for shopping with us! A.S.